Strange are the ways of Telangana Ministers and TRS leaders. They used the issue of house allocations to the maximum benefit in Warangal by-elections. TRS biggies Harishrao and Kavitha alleged that Modi government is being partial towards AP and ignoring. This is in regarding to center allocating 1,93,147 houses but Telangana was just allotted 10,290 houses out of the total 2,28,2014 houses in Housing for all scheme. As the TRS’ false propaganda is spreading, Center had issued a clarification regarding the same. The clarification said AP government sent proposals for 1,93,147 houses and Telangana government sent proposals only for 10,290 houses. The center clarified that the Union Urban Development Ministry accepted the proposals as it is. 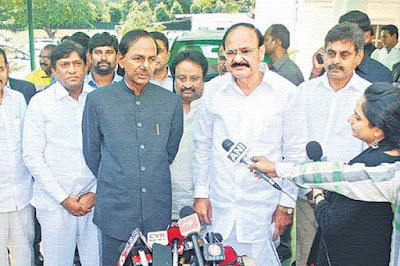 They also mentioned the letter of Telangana government (D.O. No 9927/UBS/2015) dated 17.11.2015 addressed to the joint secretary of the ministry had put forth 26 housing proposal for taking up 10,290 houses in 10 cities of the state. Looks like TRS used the issue cleverly for the elections.